YOU CAN GO HERE TO GET IT, RADIOHEAD STYLE. Trent Reznor produced most of it, and sonically, it's pretty much what you'd expect a Saul/NIN collaboration to sound like. It's great. Adventurous, thought-provoking and actually enjoyable to listen to. I think Saul, even "singing Saul," deserves all the hype he gets. Usually, if you're the #1 figure in your field, i'm going to find a way to hate on you. 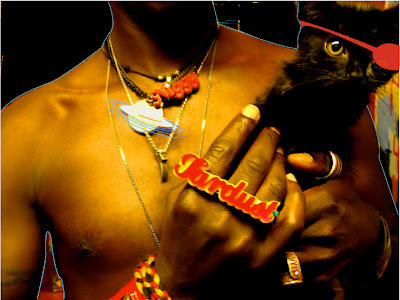 But Saul Williams is consistently beautiful. Humbling, really. I like his self-titled album the best so far, but i've only listened to this one once through. He covers "Sunday Bloody Sunday" and it works. All the tracks work, really. Trent and Saul are a natural pair i think. I won't do a full review until i've listened through a few more times, but the album lives up to expectations. hey you know what's awkward? In Pursuit of "THE REAL"